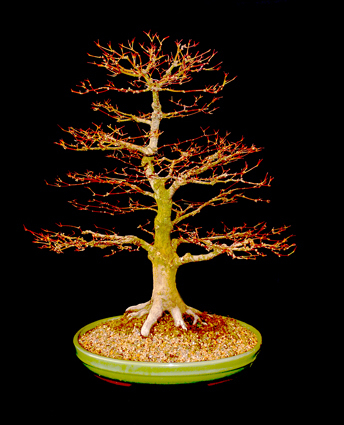 Recently Arthur Skolnik gave a lecture on wiring bonsai to our club. Arthur is known to give very informative and entertaining lectures. He is an internationally accomplished and renowned bonsai practitioner. Arthur has lectured on and demonstrated the arts of bonsai, viewing stones and Japanese gardens to local and international bonsai and horticultural societies, television and radio stations, both in English and French. He has contributed articles to many international publications, including “International Bonsai” and “Bonsai Magazine” (BCI). Among his many roles in the bonsai community, Arthur has served on the Board of Directors of Bonsai Clubs International, as a Director of the Montreal Bonsai Society, and as Vice President of the Toronto Bonsai Society. Listed below is a summary of his talk. A Bonsai is finished the day it dies, so there will always be the need for some pruning and wiring. Think of wiring as a Tao, the Way of Wiring. The best wiring jobs often belong to the best trees. ‘Best wiring’ means effective and neat. Wiring a tree is not torture, trees don’t have nerves to feel pain. to style the tree, enhance the shape and create the ideal image you’ve imagined. 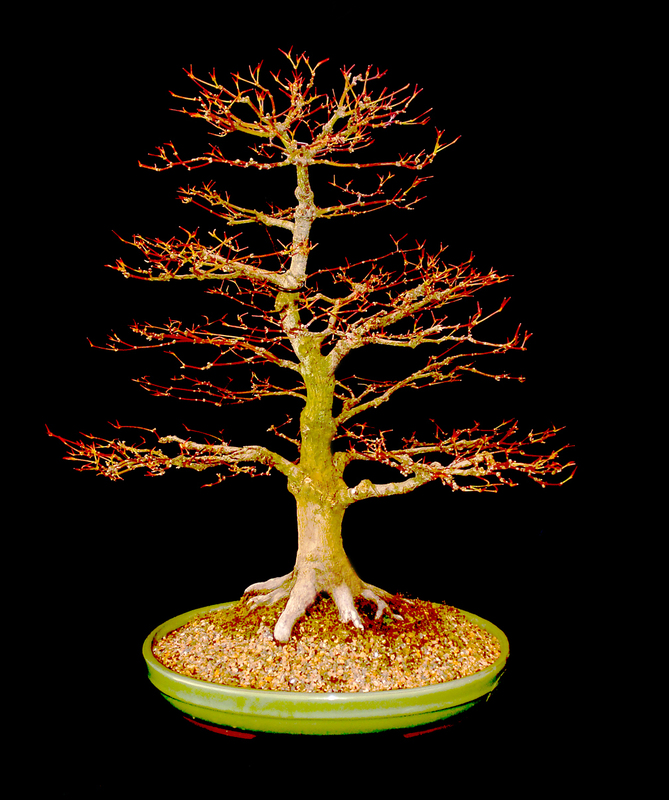 a tree in a pot is not a Bonsai unless is can be recognized as one of the Bonsai ‘styles’. wiring (and pruning) create and refine the style. all aspects of horticulture involve control; pruners control growth, wire controls branch and trunk direction or movement. a bent branch with wire on it will grow in the direction it is bent, similar to braces for teeth. wire does not prevent the tree from growing… be careful of wire marks in the growing season. a down-growing branch will take longer to ‘set’. before wire, rocks were tied to string to branches but crushed cells never healed in the wind. annealed (heat softened) copper (will work-harden) or anodized (coated) aluminum. Let the tree become dry before wiring. The cells have less turgidity, (rigidity like old celery). Before bending a big branch: ‘v’- cut below, or above, (or if the branch is old, pull by hand; if young, use a knife or chisel and mallet) or pre-bend (massage) the branch to crush cells and make a longitudinal cut through the branch using a root-splitter or sharp thin knife. Before bending, turn off the radio and stop talking. Listen to the pop before the snap. Completely wire the tree before doing any bending/shaping. Wire in the same direction as the desired twist. If twisting a lot, twist the branch as it is being wired. Use the heaviest wire first, otherwise fine wire will become buried by thicker wire and may damage the trunk because it cannot be seen. This means always starting at the bottom. Thickest wire for (a)trunk or (b)branches because they are near the bottom or (c)trunk and branch if they are similar in thickness. Choice of thickness of wire comes with practice and experience. Bend the branch then bend a wire and see if it will hold. Use wire approximately 1/3 the thickness of what you want to bend. Sometimes 2 wires are necessary, copper vs. aluminum. The right choice of wire has slightly more strength than the branch. Length of wire should be about 1/3 to 1/2 longer than the wiring you need to do. Always wire at 45°. Less will stress tissues and more will not be effective in holding. Don’t cross wires. It looks messy and the inner wire may damage wood or the branch may move in the wind. A second wire should be parallel and touching the first. Use 1 wire for 2 branches whenever possible. The goal is to use as little wire as possible. Choose 2 branches that are similar in thickness but far enough away (not too far) from each other to anchor at least once. When wiring 2 branches, start by bending the wire in half (if wire needs are equal) apply the wire at 45°, anchor the wire on one branch, (wrap it once), completely wire the second branch, then go back and finish wiring the first branch. The wire should be applied tightly but not too tight. Don’t leave air space between the wire and the wood. Don’t squeeze leaves, needles or twigs between the wire and the wood. Whenever possible, wire past a twig otherwise the wire may slow or stop water from getting to the end on the branch. Don’t bother wiring ‘fleshy’ parts unless the tree is being prepared for a show. Always cut the ends of wire off wired branches. Don’t leave dangerous hooks. Use ‘cages’ for buds on pines for better bud directional control. Relax and wire to the side you are comfortable with, but be careful your fingers are out of the way - especially on pines. Always be aware of where your fingers and hands are. Don’t shake the tree, be gentle. Remember there is a vital connection between the trunk and roots. Hold the previous coil. If wiring up, hold down. Always use 2 hands. If the plan is to bend a wire down, make sure the coil is above the bend, otherwise the wire will float off the branch and not hold. If the plan is to create curved branches (or curved thin trunks), wire should be on the outside of the curve. Sometimes if a small branch needs to be wired and an anchor is not near by, use the ‘hitch-hike’ method. Cut a point on the wire and be careful not to knock off old bark when inserting it under a wire. Stop wiring and cut the wire when the thickness of the branch of trunk thins to the next smaller size wire. Or, go as far as you dare, but thick wire takes up space and looks bad. If need be, use a guy wire, or tourniquet, but be careful the tree doesn’t lean as the branch is being pulled down. Use stainless steel or brass screws as anchors into the tree if need be. Use rubber, plastic or cork under guy wire or tourniquet to protect the wood. Steel rods, branch benders or 2x4’s can work better than wire if the job is too big for wire. Check for wire damage frequently, especially during the growing season. Young vs. old. Check the branch angle/placement to make sure you or animals or birds haven’t moved them. Slightly longer coils are fine for conifers; shorter for young trees, if a lot of bending is the plan. There should rarely be more than 3 wires on any area of the tree.